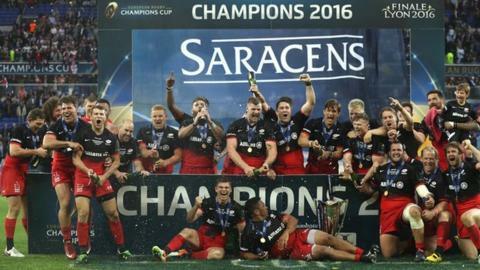 Saracens chairman Nigel Wray hailed Saturday's maiden Champions Cup victory as the result of an "amazing journey" - but warned there is more to come. Wray has been an integral part of the club for more than two decades, first investing in Saracens in 1995. "It's been an amazing journey. It's been 20 years, I just want to keep it going," he told BBC 5 live. "I look at this team - they're so young - and think 'wow. What can they do in the next five years?' They'll do more." Speaking after the 21-9 win against Racing 92 in Lyon, Wray added: "I have had so much joy, and fun, and learning from Saracens." Wray's financial support in the 1990s - shortly after the advent of professionalism - enabled the north Londoners to recruit international stars such as Australia's Michael Lynagh, France's Philippe Sella and South Africa's Francois Pienaar. He has been ever-present since, and despite selling a 50% stake in the club to a consortium led by South African businessman Johann Rupert in 2008, Wray remains a pivotal figure at Saracens and an influential presence in the English professional game. Saracens boss Mark McCall paid tribute to Wray, and said Saturday's victory was the greatest feat in the club's history. "I'm chuffed for Nigel Wray, who has put 20 years of his life into the club," McCall told BBC 5 live. "I think it has to be [the high point], because everyone knows this is the elite competition. It is unbelievably hard to win."